Hey, what’s this? 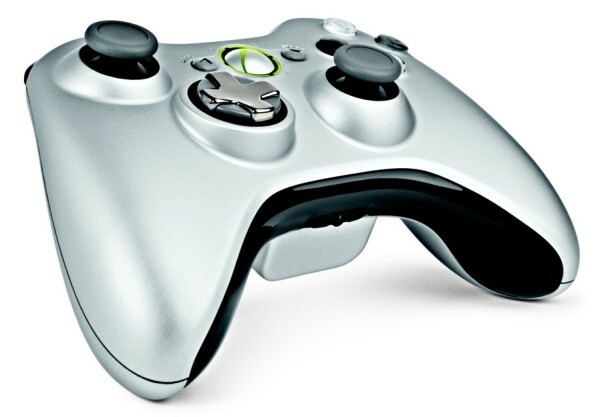 We just started hearing rumors this morning that Microsoft was planning a new Xbox 360 controller with an improved D-pad, and bang — Major Nelson just went live with a YouTube video detailing the new piece. The new D-pad is a trick new patented design that’s just as we heard fromJoystiq: it’s a disc in the normal configuration, but a quick twist raises the crossbars about a quarter-inch, making it eminently more usable. (That sound you hear is joyous weeping.) The analog sticks have also been slightly tweaked to be concave, and — wonder of wonders — the ABXY buttons are now translucent monochrome instead of colored. Wild. The new matte silver controller will only come bundled with the Play and Charge kit for $64.99 when it launches on November 9 in the States and replaces the existing wireless controller — it’ll hit Europe around February. Yep, it definitely seems like a major upgrade, but we’ve got a couple questions: when will it replace the packed-in controller? What about all the people who just bought new Stealthboxes and got the older controller? And, most importantly, when can we have one to try out? We’re pressing for answers and we’ll let you know — check the video after the break in the meantime. 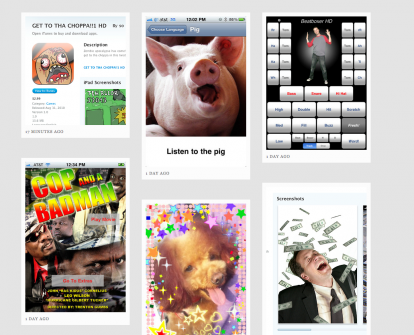 Crapptastic è un nuovo sito Internet che nasce con l’intenzione di raccogliere e catalogare tutte le peggiori applicazioni che, nonostante i rigidi processi di approvazione Apple, vengono pubblicate giorno dopo giorno in App Store. Sicuramente, navigando tra le pagine del negozio virtuale Apple tutti avrete notato l’elevato numero di applicazioni piuttosto demenziali che, nella maggior parte, dei casi vengono catalogate come “inutility” dall’utenza. D’ora in poi, questo genere di applicazioni saranno inserite su Crapptastic dagli amministratori del sito, in modo tale da formare una vera e propria raccolta delle “migliori” peggiori applicazioni dell’App Store di Apple. Sicuramente un’idea che lascia sorridere anche se, con ogni probabilità, gli sviluppatori che vedranno “elette” su Crapptastic le proprie applicazioni non potranno essere molto soddisfatti. Microsoft annuncia la presentazione della nuova suite per fine settembre e ci mostra come appariranno le scatole nere e gialle delle versioni disponibili in Italia. La prossima suite Office 2011 per Mac uscirà tra ottobre e novembre, arriveranno prima le versioni inglesi e poi quelle italiane nei modelli “Home & Business” e “Home & Student”. Si noti che la seconda è priva del cocoizzato Outlook, che nell’altra prende il posto di Entourage. Come vedete a fondo pagina le confezioni continueranno ad usare i colori che le hanno distinte nell’attuale versione 2008 (la nera tende più al grigio). Ricordiamo che acquistando oggi Office 2008 (a prezzo scontato, se lo trovate) potranno ottenere Office 2011 gratis quando disponibile. Intanto Microsoft ci ha mostrato nella prima e seconda puntata degli appuntamenti con il marketing le novità che ci porterà Office 2011. Microsoft has decided on the branding for its all-new Office 2011 for Mac releases, offering the two packages in grey and orange boxes, Setteb.it reveals this morning. And here’s the pictures to prove it. The release of Microsoft Office for Mac 2011 will be simultaneous across 100 countries at the end of October. 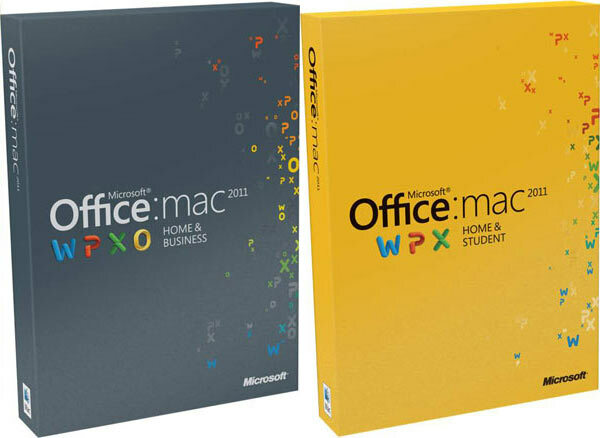 Two versions will be available, Office for Mac Home and Student 2011 and Office for Mac Home and Business 2011. It will cost between $99 and $119. 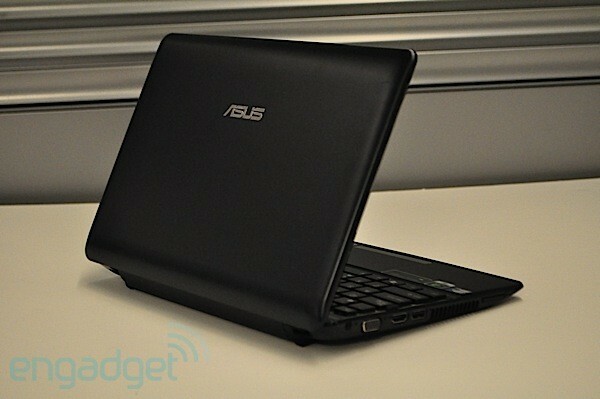 About nine months ago ASUS released its 12.1-inch Eee PC 1201N to much fanfare. 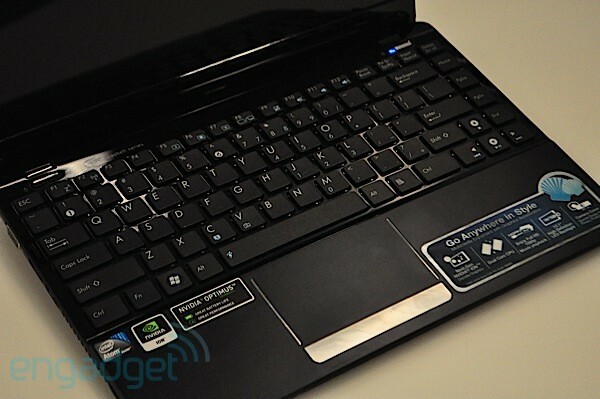 It was the first "netbook" to pack NVIDIA’s Ion platform and a desktop-class Atom processor. Translation: it absolutely wrecked regular netbooks (and even other Ion netbooks) on the graphics and performance battlefield. Indeed, the 1201N blurred the lines between netbook and regular laptop, but we ultimately knocked it fairly hard for not lasting longer than 2.5 hours on a charge — it was dubbed a "netbook" of course. Our apologies for the brief history lesson, but it’s actually quite important in understanding why ASUS’ second generation of the 1201N is such a big deal. The 1215N has a Pine Trail 1.8GHz dual-core Atom D525 processor and NVIDIA’s Ion 2 with Optimus, which no longer requires the GPU to be running the entire time and saves battery power. The $500 rig (though we’re seeing it on sale for as much as $599) is still on the pricey side for a "netbook," but promises 1080p playback, seven hours of battery life and a 250GB hard drive. So, does the 1215N correct all the wrongs of the 1201N and live up to the "netbook powerhouse" title that ASUS has given it? 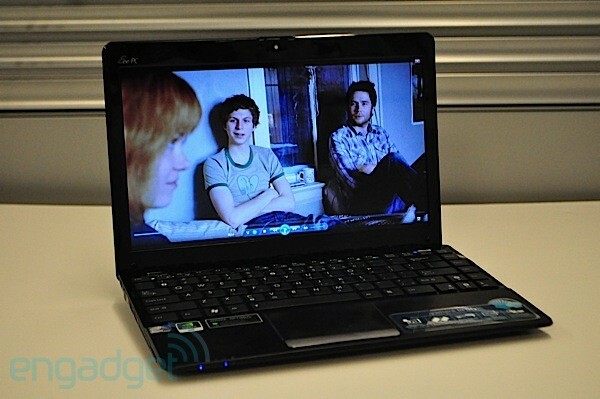 And more importantly can it compete with some of the newer thin and light laptops, like the Dell Inspiron M101z? We found out, and we’re assuming you want to as well in our full review after the break. The 1215N doesn’t look all that much different than the 1201N, and that’s not necessarily a bad thing, especially since ASUS tossed the glossy black lid for one a matte, rubbery-feeling one. It’s no bamboo, but it’s nice enough for a $500 system, that’s for sure. Still, there are left over trails of glossy plastic — the screen bezel and keyboard deck still shine, while the palmrest is made of the same soft matte plastic as the lid. Just like the Eee PC 1018P, the laptop has a more professional look than other netbooks, and the rounded edges give it a familiar aesthetic. We’re quite content with the look of the 1215N, but the size is a bit of another story. The 1.4-inch thick system is nowhere near as svelte as the .7-inch Eee PC 1018P, and though ASUS claims it weighs 3.2 pounds it felt heavier in hand than the 11.6-inch Dell Inspiron M101z and Acer Aspire One 721. We’re not saying the laptop is too heavy to carry with one hand or fit in a smaller shoulder bag, it’s just a bit chunkier and heavier than we expected it to be. Of course, that means there’s more room around the system for the ports; there are three USB 2.0 ports along with VGA, HDMI, mic, headphone and Ethernet jacks. 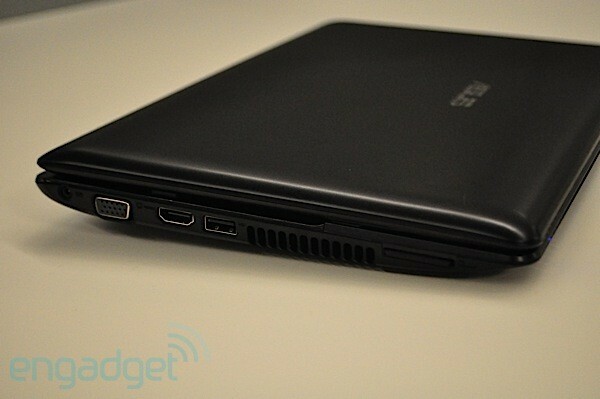 The US version of the 1215N does not have a USB 3.0 port, though other SKUs overseas will have the higher speed jack. We realize the 1215N’s chiclet keyboard is the same as the one on the 1201N and the most recent Eee PCs, but the matte keys seem "clickier" than those on the other laptops. Additionally there’s just a significant amount of flex to the whole panel. While typing this review we noticed the entire panel caving in at times — it’s not pretty and we’ve seen much better quality ASUS keyboards, like that on the U33Jc. There’s no questioning that we prefer the chiclet keyboard on the M101z. We have much kinder words about the 3.5 x 2.2-inch touchpad. Besides being quite wide, the plastic is soft to the touch – no, really, your finger will thank you for the nice feeling surface. As usual, the multitouch was a bit sensitive; two finger scrolling was fairly accurate, but we disabled the pinch-to-zoom setting since we kept mistakenly zooming when we just wanted to get to the bottom of a web page. It’s probably no surprise that we’re not the biggest fans of the viewing angles on the 12.1-inch, 1,366 x 768-resolution display. Besides being extremely glossy, sitting to the side of the screen caused severe color distortion. Vertical angles were a bit better, but required us to tilt the screen to about 90 degrees when we wanted to sit back and watch the Scott Pilgrim trailer without causing Michael Cera’s eyes to blend in with the rest of his face. Despite the viewing angles, the screen was sufficiently bright and a 1080p trailer at full screen was a very detailed. The speakers under the front lip of the machine actually sounded quite loud for a 11.6-inch and 12.1-inch laptop. Similar to the Inspiron M101z, they sounded full when listening to Ra Ra Riot’s newest album in iTunes. Although Intel’s just released its first dual-core Atom processor for netbooks, the 1215N was slated before the new chip arrived so it’s powered by a desktop-grade 1.8GHz Atom D525 CPU and 2GB of RAM. And unlike most netbooks, it runs Windows 7 Home Premium – see why we’re of the mind that this thing is more a thin and light laptop or ultraportable than a netbook? Regardless, the extra processor horsepower is noticeable in everyday performance. The 1215N just felt speedier when opening applications and didn’t huff and puff to play a 720p video while simultaneously running Chrome with a handful of tabs open, Microsoft Word, Tweetdeck and Trillian. Obviously, that bit of high definition video muscle comes from NVIDIA’s second generation Ionplatform. We’ve been told that NVIDIA’s actually using its lower-end GeForce G210 GPU, but on the laptop it appears as just "Ion." Regardless, the 1.2GHz, 16-core GPU gives Atom some serious graphics power. Before we compare it to the other platforms out there, we can tell you the GPU fired up – thanks to NVIDIA’s Optimus – when playing back a 1080p YouTube clip and output some really smooth picture when we hooked the laptop up to our 40-inch HDTV. But beyond local and streaming HD content, the GPU is capable of handling some games as well. At the native resolution, our World of Warcraft gnome was prancing about the magical forest at a steady 26 frames per second. Comparatively, as you’ll see in the chart below, NVIDIA’s Ion 2 provided about double the performance of the previous generation and even ATI’s Mobility Radeon 4225 graphics. Still, it should be noted that ATI’s platform is perfectly capable of full HD playback. So, does all that extra performance power impact the battery life? Well, the good news is that NVIDIA’s Optimus has absolutely helped in that area, and when the GPU is off the battery life is pretty impressive. On our video rundown test, which loops the same standard definition video at 65 percent brightness, the six-cell 56Wh battery pushed out nearly six hours of juice – five hours and 42 minutes to be exact. That’s more than double the run time of the 1201N! With the GPU on we got 2:45 hours. Still, that’s significantly better than any of the AMD Nile systems we’ve tested lately and just as long as some single-core netbooks. We suspect that the new N550 processor will allow a system like this to get a bit more juice, but we’ve yet to test the processor performance yet. Like a lot of the recent ASUS machines we’ve looked at, the 1215N comes jam packed with proprietary software and some other stuff, including a shortcut to Bonigo’s WiFi service. Along with ASUS’ typical EeeDock, which is locked to the top of the screen, the machine comes with ASUS’ Splendid photo editing software and some new Locale program that seems to want to locate where you are using Bing maps, but didn’t seem to pinpoint our top-secret whereabouts. Also, it will boot into the ExpressGate instant-on OS by pressing the small button located on top of the keyboard. 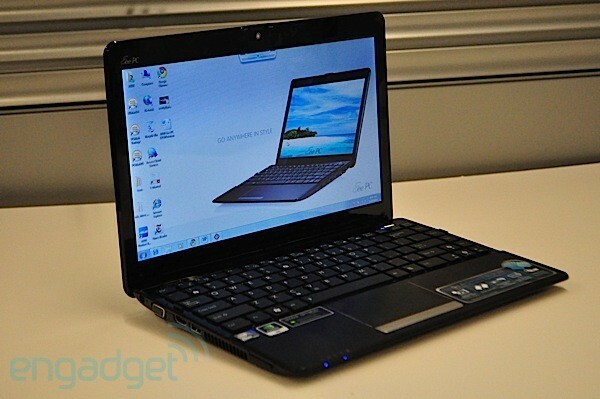 Without a doubt, the Eee PC 1215N is a major step up from the preceding 1201N. The graphics performance is significantly better and the battery life is double what it was before. But even beyond that, its Intel Atom / Ion 2 combo seems to top some of the recent AMD Nile-powered ultrathins or netbooks we’ve seen lately in both of those key areas. That said, we actually happen to prefer the dual-core AMD K325-powered Dell Inspiron M101z in terms of overall build quality to the 1215N — the manufacturing quality just feels sturdier and the keyboard is miles better than the one ASUS is using. But if you’re the type that cherishes graphics performance and battery life over hardware feel then the ASUS Eee PC 1215N is your best bet right now for a affordable ultraportable or premium netbook under $500. 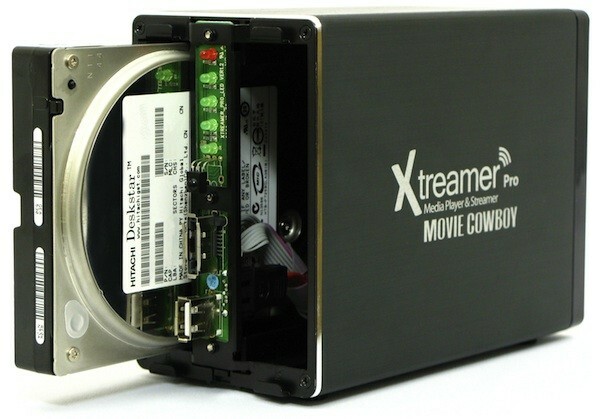 Your media streamer options aren’t exactly limited these days, but if you’re looking for one that will also double as a NAS (and prefer to get your gear from Japan), you might want to consider Digital Cowboy’s latest addition to its Movie Cowboy line: the Xtreamer Pro. This one packs the same dual 3.5-inch hard drives as the company’s previous DC-MCNAS1 model (not included), but adds an HDMI port to directly connect to your TV, and what appears to be a whole new interface to let you access the wide variety of media the device supports. No word on any plans for a release over here, but you can look for this one to be available in Japan next month for ¥22,000, or about $260. For all the stupid pet tricks, first-person confessionals, and clips from Conan O’Brien’s formative years that form YouTube’s content, the one territory it doesn’t really venture is pay-per-view à la Apple, Amazon, and others. Well, it’ll be a Brave New World for the service — and parent company Google — if this Financial Times report is worth its weight in 3mm. According to the publication, the G-Men have been in talks with "Hollywood’s leading movie studios" for several months, touting its reach as one of the main draws for the players involved, for the launch of an international pay-per-view service by the end of this year. Some prices are also thrown around here, to the tune of about $5 for new titles (streaming, not download) available the same time as the DVD releases. The video site has been doing rentals on a trial basis since early this year, with just a smattering of indie titles. The thought of paying to watch Blockbuster titles in the same window we watched three dozen (if not more) remixes of Keyboard Cat is still a bit of a new concept, but hey, that’s the future for you. Tra poco, come ben sappiano, gli studenti devono tornare sui banchi, perciò Apple ha aperto una nuova sezione per raggruppare applicazioni nell’AppStore: App per tornare sui banchi [Link iTunes]; contenente tutte quelle applicazioni che possono servire sia agli studenti di scuola superiore sia agli universitari. La sezione è divisa in altre 6 comode sottosezioni. Quante volte vi è capitato di dover utilizzare l’iPhone durante la sincronizzazione di brani o un backup? Da oggi potete farlo grazie all’applicazione Synchronicity. 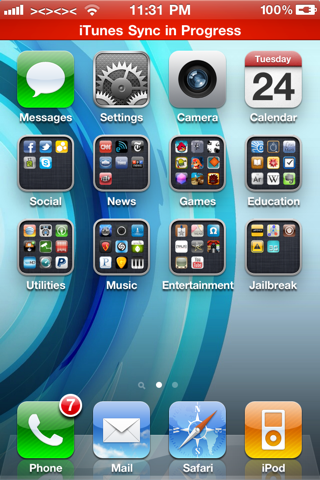 Questa applicazione, compatibile con iOS4 e superiori, una volta installata consente di utilizzare ogni funzione dell’iPhone anche durante la fase di sincronizzazione con iTunes. In alto vedremo infatti l’avviso della sincronizzazione in corso, che scomparirà non appena terminerà la procedura. Synchronicity è disponibile su Cydia al prezzo di 2$. The first shots are coming in of Yerba Buena Center getting decked out for the Apple Event. Can you feel the excitement?